Wow, thanks - I can't believe I didn't know that! For some reason I made the assumption the pinout would be standardised on these. Knew it had to do be something simple I was missing. This has surely got to be the answer. The LMs no longer die and I have a perfectly working impact section - sounds coooool. However, I am getting nothing from the noise section (tracing it it seems to be very low level noise all the way through, never getting amplified), and the shell section seems too quiet, with a short decay and a rather distorted sound. Also the ring modulator signal bleeds through all the time, though that may just be because I have it turned right up due to the low shell volume, I dont know. Now where do I start is my question! So the discovery of the evening (so far) is that setting the ring mod balance seems to be affecting the level regardless of whether the ring mod depth is set to zero. The level is still significantly lower (it seems to me) than the other sounds, but it's much better with the balance set either all the way down, and best with the balance set all the way up. As in closer to 3Vpp better at J2. I just verified all my resistors and pots are correct; only one exception, the CV range pot R85 is 10k instead of 100k. Since I'm not trying to CV this yet, I don't see that being my problem (and the pot is one of a couple that are entirely surrounded by panel wires, so I will not be fixing it right away). 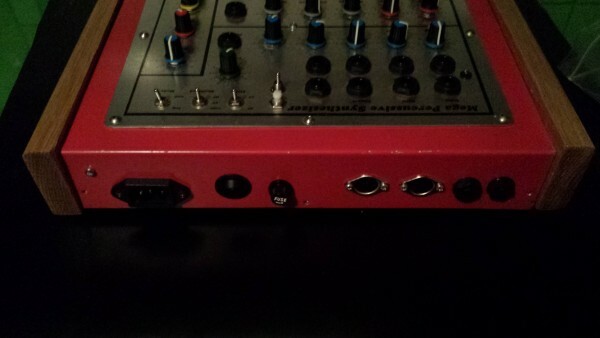 I did recently hear of someone who was having problems with a completely different module until they put in an input attenuator (they were doing bananas and didn't want one). So I'm reconsidering whether that 10k mistake might have some relevance as well. What I did though was to just run through a 4 line submixer that effectively acted as a preamp. Thanks so much again for getting back - yes - I too have noticed the ring balance affects the shell volume which is strange, no? The shell volume is OK at max for now but would be good to understand why this is happening. I don't even have the cv pot attached as of yet so don't see how that can be affecting it? Re noise, where in the chain should it first be reaching audio volumes? After the Envelope? I'll have to look at the circuit when I'm at home, which will be many hours from now. The system I was talking about was an MOTM-440, and apparently the input would not work without the (very simple) input attenuator. I haven't grasped why that was either, but figured it might be worth checking. I'll see if I can find time to look at it tonight (which is in doubt) or tomorrow night at the latest. 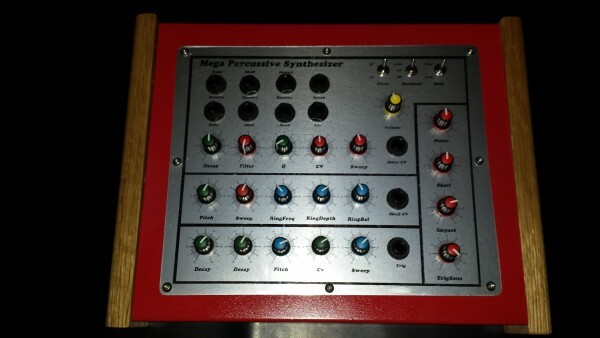 Hey Joe, nice to meet another modular DIYer from Brighton! I've built two of these, and both have the same thing you mention about the balance control affecting the Shell volume even with no ring mod dialled in. The Shell is loudest when balance hard-right, quietest when centred, and medium loud when hard-left. When the ring mod is turned up you get the strongest effect with balance centre. I think it might be part of the circuit design, and can be quite good to get different tones from the Shell. The Shell is very much quiter than the Impact and noise, not sure how it could be boosted to get it to equal power. What's weird is the docs say it should be 10Vpp, so loudness should not be an issue. I wonder what's different about our components that is leading to this. Have to re-read again and see if I overlooked something. Hey NoiseToyz, I'm up in London now actually but am a regular return visitor to btown (should update my profile!). Your video was useful! Threw in the towel and got myself another MPS board and gonna rebuild it, hopefully if I get the new one working it will be a lot easier to work out where the other one is going wrong and I can end up with a two voice. For now replaced the XR chip with a new one from cricklewood and that solved the noisy shell section, but it is still quiet, also still have ring mod bleed. Cool, thanks Kevin. I remember reading somewhere that Thomas was concerned about "large or negative" voltages being used for CV and blowing an IC -- is that an issue here? Anything I'd want to avoid patching in? 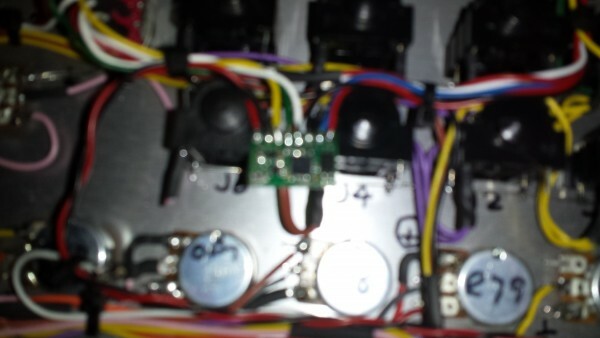 Those nodes appear to be ok -- note that they are fed from the front panel control that swings to 15v. I haven't blown anything from these mods... but I say this with the disclaimer that your results may vary. anode to pin 7 (output pin) and cathode to pin 6 (inv input). This protects against negative voltages. Kludged in a 33K resistor. This goes from IC6b pin 6 (or the junction of R64 and R65, same thing). The other end is wired and heat shrunk and soldered to the J13 header (this is for pcb REV 107). 33K seems to give near the full swing of the Noise filter cutoff. I used the input to impose LFO rhythms over the Noise while playing. You can also hook a voltage pedal here to change the character of the Noise as you play. That portion of the circuit is like the "Improved Linear Current Source" from the TH 3080 book. Another change I made was to increase the levels. I replaced the R40, R91, and R92 200k resistors with 100K. I also replaced C29 with a 3.3uF bipolar cap. I've been playing these with piezo drum pad triggers. 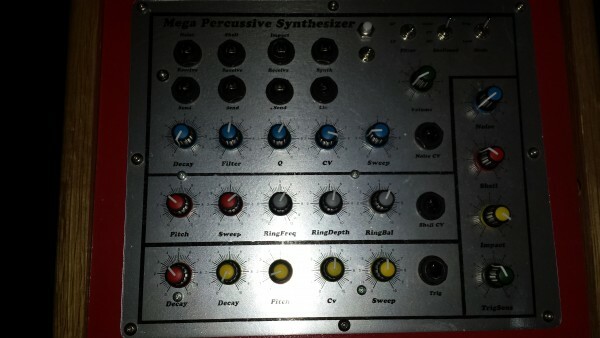 The MPS has good dynamic response and is so much fun to play. Subject description: Team Document- Assemble! I have recently purchased a pair of MPS PCBs, rev 107.
the most current schematics and front panel requirements. I was wondering if someone could repost them? Or if there's a link to this info, it would be much appreciated. First post, but I've been studying this site for about a year. It's a fantastic resource , you've taught me so much! Thank you to all the kind inventors for sharing their knowledge. This thread is so long it's a wonder anyone actually figures out how to build these things. 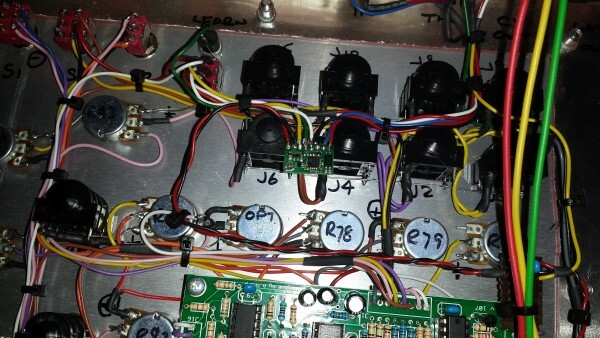 Firstly, get the most official docs from Birth of a Synth. "MPS Theory" is worth a read but "MPS build" is where you'll find schematics, BOM, etc. Here's a very useful reference graphic for figuring out where the board wiring goes. The most thorough and digestable front panel realization of the MPS design is at Bridechamber. And of course if you happen to use MOTM format or are building this into a box, you might even consider buying a panel. What are the recommended Jumpers for this PCB? I know they are not essential, but sure help tidy things up!- and I can't mention how many wrong types I have ordered! Also, there are specific types of Cap mentioned in the parts list. Can anyone recommend some suitable Disk and Mylar Caps? hi guys me and a friend have been working this project we had the nomal problem with the XR 2206 batch 0919 the version I have now is the 0918 not shure if any one had this batch version I got it form littlediode was a round 7 pounds we tested it with a oscilloscope well a friend did as I am such a newbie here a picture we are going to add midi to it I made the case and the box and the oak panels he did the wiring as it was very confusing because he been into electronics for years and is a cad designer he done a cad drawing of the wiring. I try and get him to give me a copy also if we done any thing wrong it would be good to have feedback .. The shell pitch control has stopped working on one of my MPS's. It's just outputting a very hi pitched triangle wave. I checked with a scope and the output pin 2 of the XR2206 is still giving a pure triangle so the chip must be working. 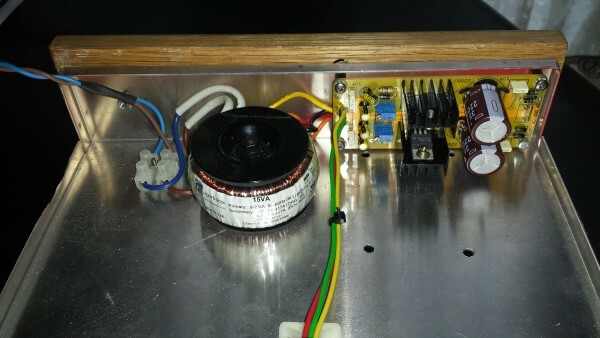 The noise and impact generators are also working as normal, so it must be something to do with the voltage control circuit going to pin 7 of the XR2206. CV Range, Sweep, and Pitch controls all have no effect on the Shell section. I can't see any evidence of burn-outs but I'm wondering if it might be the transistors Q7 and/or Q14 that might have blown? I set the mod switch to impact and turned up the CV range control to maximum and this signal appears at the one side of R75 - [8v p-p square], but on the other side of the resistor it's only just measuring on the scope, and pretty blurred and noisey. Anyone super clever here that might know what's going on from my very basic description? Have you checked the DC value on the far side of R75? I'd say your guess about the transistors is where I'd be looking first as well. No - what value should I look for here? Testing and troubleshooting are the areas I need to put some work into. I've only got a basic working knowledge of electronics and need to widen my knowledge of circuit design to help inform my troubleshooting. I unfortunately have no complete references to recommend. I would say Ray's book is helpful, but still a bit basic.... a good place to start if you want to build skills. The way I approach it generally is to think about how things should be, or failing that, compare them to a working version of the same (assuming one is available). 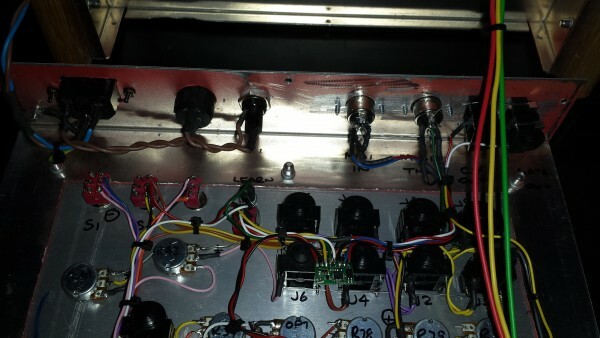 I was just working on a filter with bad integrator caps, but it was a filter type I've not worked on before so I got all wrapped up in "how does this part make that part behave" and 'are the chips any good' (which i tested them all and they were). In the end, DC comparison between a working and non-working version led to a cap that was shorted, at which point I looked at all the caps and realize that both integrating caps were damaged. What led me there was the realization that the cap had to be a dead short because I was getting the DC value on the other side passed through. So my point in checking the DC: if you read -15V (or nearly so) at the base of Q14, it's a very likely thing that the transistor is bad, you won't just be guessing that it might be. If I get a chance this weekend I will try to remember to post some DC readings from around that area, and maybe some scope shots as well. Yes I see your logic - I just had a poke around with my multimeter and ran a comparison with my other working MPS and noticed that the collector of Q7 seems to be 'stuck' at 1.02v even when I move the shell pitch. Might be Q14 too. Not a lot of current would be going through Q7's base relative to the current that would be going through Q14. If it were me and I didn't care which was at fault, I'd replace both of them. If I did care, I'd do one at a time, but be prepared to do both. I swapped out Q7 and Q14 for new ones and happy to say it's all working nicely - thanks elmegil! Does the MPS absolutely need to be powered by +15v/-15V, or can I get away with using a +12v/-12v supply? I'd imagine there might be some resistor changes necessary. 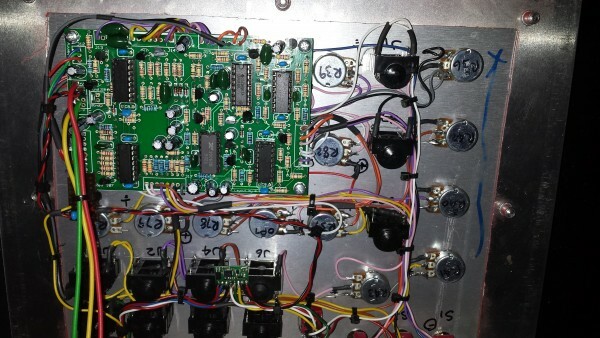 I only am asking because I have a 12v bipolar supply build from a previous synth that is currently unused. I could just get a larger transformer and swap out the regulators obviously but don't have a 15vAC supply on hand. Thanks.